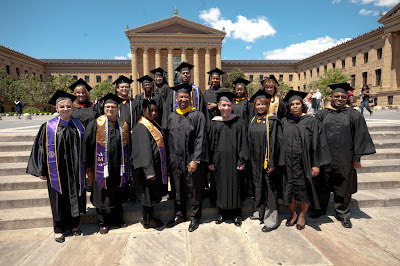 On Friday, May 11, 14 Peirce students from the 2012 graduating class joined Mayor Michael Nutter; U.S. Congressman Chaka Fattah; City of Philadelphia Chief Education Officer Dr. Lori Shorr; former lead singer of Sister Sledge, Kathy Sledge; and other students and educators from across the region at a citywide graduation celebration. The event honored Philadelphians who have earned their college degree and celebrated the city’s focus on education and degree attainment. Among attendees representing Peirce College were Atiya Goldsmith-Irby, the 2012 Commencement Student Speaker, as well as Daria Ward, one of Peirce’s eldest graduates. To view more pictures from the event -- including photos of Kathy Sledge’s performance of “We Are Family” -- visit the Peirce Facebook page!